(Editor’s note: The following history has read by Martha Roberts as part of the closing service at the Johnstown UMC on Sept. 12). JOHNSTOWN – The Johnstown class of the Church of the United Brethren in Christ was organized by Rev. A Rider of Westfield in 1887. He was serving as a supply pastor for the Toledo Circuit. From the date of its organization, the Johnstown Class was served by Rev. Rider as an appointment on the Toledo Circuit. During the annual conference session held in Westfield in September 1888, the Janesville Circuit was formed. This circuit consisted of Janesville, Zion, Unity Chapel and Johnstown. Rev. F.M. Buckner was appointed the first pastor of the Janesville Circuit. Johnstown has been part of seven circuits since its organization. The Johnstown Class did not have a building of its own in which to worship until 1899. Worship was held in a church building belonging to the Christian Church. This building was shared with all the orthodox denominations in the community. From 1887 to 1897, the Johnstown Class grew very little in numbers and financial strength. The Conference Minutes of 1898 report a very substantial growth in membership and finances. Early in February 1898, the Johnstown Class decided to build a house in which to worship. The following persons were named Trustees: Charles Connell, C. Laymon, Joseph L. Ozee, D.F. Jones and Sidney Greeson. The Building Committee consisted of the Trustees and James Beals who was to direct solicitation for money and materials with which to build. Those who carried subscription papers were Charles Connell, C. Laymon, D.F. Jones and Clarence Ferguson. These papers made it clear that all orthodox denominations were free to worship in the church when it was not in use by the United Brethren people. Land on which to build the church was purchased from Dr. Johnathan Shull for the sum of $50. The building was started Feb. 10, 1898, and was completed Feb. 1, 1899. It was not dedicated at the time of completion. The Christian Church held all of its worship services there and continued to do so until it was dedicated as the United Brethren Church in Christ, Aug. 7, 1908. In 1946, the United Brethren and Evangelical churches merged into the Evangelical United Brethren Church. The merger was graciously accepted by the members of the Johnstown church but did not create a major difference in the way the church functioned from day to day. Church attendance fluctuated greatly during this period with generally low attendance during the winter months, but as many as 25 attendees during the months of good weather. 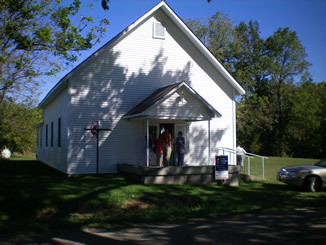 In the 1950’s the Church experienced a period of growth and a Sunday School room was added to accommodate the number of children who were attending. In 1968, the Evangelical United Brethren Chruch and the Methodist Church merged to form the United Methodist denomination. Names of some of the organizations within the church were changed, but again the merger did not greatly affect the church operation. From 1968 to the present, the Johnstown United Methodist Church has experienced a number of changes. Because the church is located in a stable, rural community, the church has suffered attrition which it has not been unable to stop. Children who attended the church have grown and moved away. Some families left the church to attend larger churches where there are more opportunities for the young people. As the church population grew older, death has taken many away. In 1956, there were 75 names on the Church roster; today there are 10. In the 1950’s, it was not unusual to have 45 persons attending the worship services. Today, there are four; six if you include the minister and his wife in the count. The church building has seen periods of war and periods of peace. It has seen periods of economic depression and periods of a flourishing economy. It has seen its people grow old and few. The Johnstown United Methodist Church has fulfilled its mission and on Sept. 12, 2010, is sending its people to worship in other places.